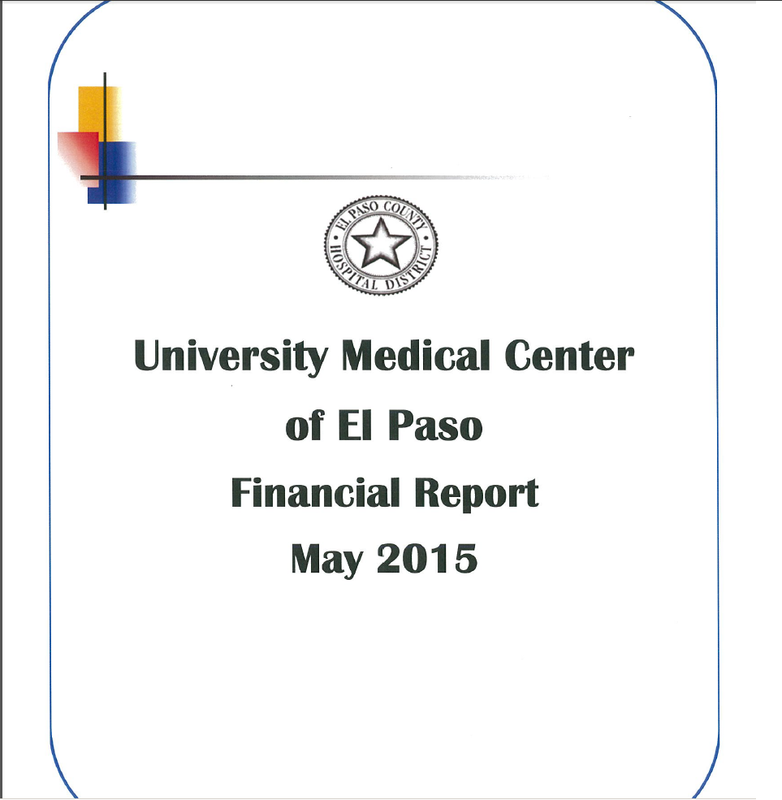 A helpful reader sent us a copy of our county hospital’s May 2015 financial report. The report is fascinating in what it does not disclose. Nowhere in their listing of assets does the report show the $100 million or so that they claim they are owed by the children’s hospital. It also does not show the income that they say they are owed from the children’s hospital every month nor does it show any bad debt reserve or expense. 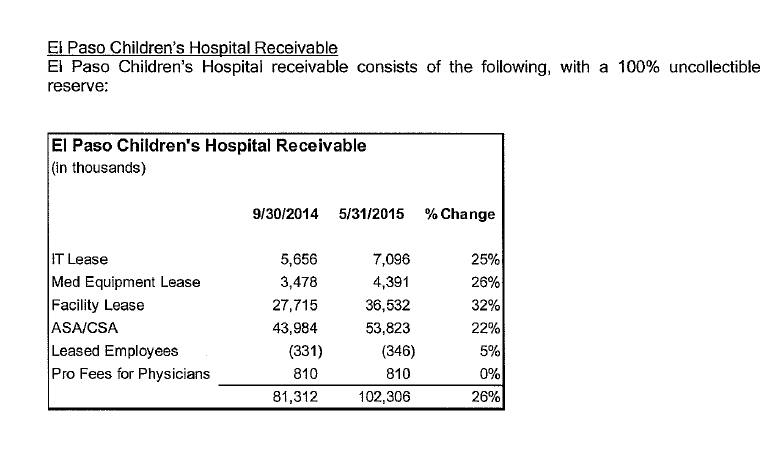 In other words their balance sheet and income statement make no mention of the children’s hospital. If you did not know to look further you would not know that the situation even exists. Convenient huh? As of May 2015 we can see that they have written off the entire $102,306,000. That means that they do not expect to see any of the money and that the taxpayers have already eaten the bill. Now we are hearing talk about the children’s hospital trying to find a strategic partner but having trouble because of their debt. It seems that this is just another ruse. If the county wanted to they could forgive the debt and the taxpayers would be no worse off. That might allow some outside organization to start fresh and maybe keep the children’s hospital away from the county hospital and thus our tax bills. This entry was posted on Monday, September 28th, 2015 at 5:00 AM and is filed under County Government. You can follow any responses to this entry through the RSS 2.0 feed. You can leave a response, or trackback from your own site. 10 Responses to What debt? why are the negotiations between UMC and EPCH, both funded by taxpayers, being treated as confidential? why are Escobar and UMC intent on us not knowing the terms being discussed? we know she is siding with UMC, so is it because UMC is the one being unreasonable? the public has a right to know NOW. Even if the debt is written off, there is still the question of repayment of federal funds and penalties for fraud. The bond debt also still has to be paid. Very little of the principal amount has been paid. We’ll be paying for this for a long time, while Valenti will be retired and living large. El Paso needs to put bond default on the table which all the people who made this happen will oppose, so they can keep issuing debt to fund their dry dreams. But a default will put investors on notice to not trust them and so protect us. Even higher than the amount owed for rent is the $50 million plus that UMC claims to be owed for administrative services. That’s the ASA line. I would like to know the services UMC provided and their true cost of providing those services. No one will ever convince me that UMC has not been trying to profit from EPCH to subsidize UMC’s own losses. The amount UMC is charging EPCH for rent also exceeds the debt service on the cost of of construction. Gee. That sure sounds like fraud. Where’s Senator Rodriguez? Better yet, where’s the SEC? Didn’t the hospital in collusion with the County Judge Escobar sell debt instruments to fund new clinics (yet another Escibar-Valenti scam?). Did they disclose to investors that this multimillion dollar receivable was impaired, i.e., ny collectible? Senator Rodriguez is just a politician. He is not interested in protecting taxpayers money only his own interests. Well, obviously, the last thing those people want to do is actually reveal the full truth of how they have stolen from the taxpayers. And, God forbid that they should ever admit to any wrong doing. And, it goes totally against their grain to do anything that might actually benefit the taxpayers. So, we’re left with this crap.